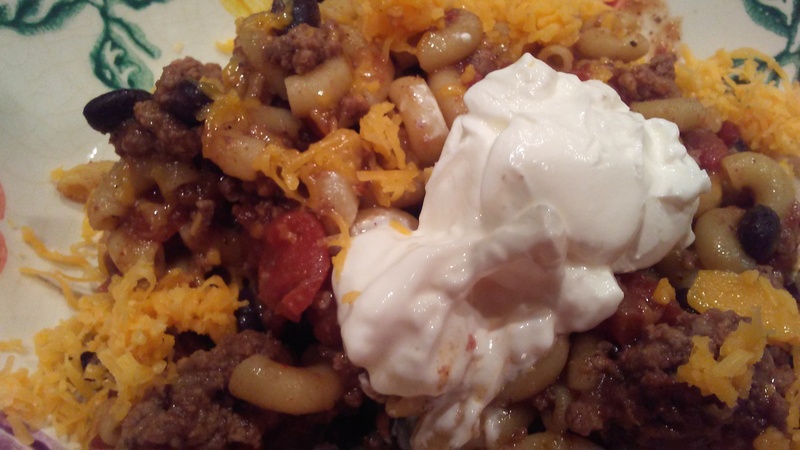 Slow Cooker Chili Mac – What's for Dinner Moms? When we are to the last day of the month I love making these dishes that pull all the odd cans or pieced of stuff you have to use from your pantry or refrigerator. The best part for me is that I made it in the slow cooker AND everyone could eat off it for a day or so. My family liked this because it had tons of chili flavor, just a dash of heat, yet they could add cheese and sour cream to make it comfort food or a splash of extra hot sauce to make it even spicier (you can even add some sliced jalapeno if you like). Have an older slow cooker or none at all? I love mine and use it all the time. Since I have upgraded I have noticed some things cook faster so watch yours and adjust times up or down until you know what works best in yours. Mix all ingredients except for pasta in the slow cooker bowl. Cook for 6 to 7 hours on low. 30 minutes prior to serving stir and add pasta to dish. Stir well every 10 minutes until pasta is cooked usually 20- 30 minutes. Serve hot with toppings as desired. I love chili (I make the best!) and I love mac’n’cheese! Maybe next time I’ll combine the two! Great simple dish. I would never eat it until I got older. Now I love the flavors. I love slow mac, but I have been able to find a healthy balance with how much to eat! So Delian! Thanks for sharing! I must try this. It looks absolutely wonderful and easy to make! It is! The best part is you can add whatever you like for veggies and more or less spices to make it as spicy as you like! Hope you have fun with it. Thank you for the reblog and mention.